I’m (Jo – Anne’s Attic – design) so happy to be co-hosting today at Share Your Cup Thursday #204! Welcome everyone and thank you for all of your kind support and wonderful well wishes and prayers since I have been down. I have felt them and am ready to return to you next week! I can’t wait to share with you some of the projects that I has able to finish up while recuperating. Welcome to Share Your Cup (SYC ), the party where you share what makes you happy – it’s what your hosts call “filling your cup”. Let’s see what Jann and Carol have been up to this week. Jann and Carol are hosting a Garden Party with the gal’s from Thoughts of Home. Be sure to check this out on the 27th of June. Jann – Have a Daily Cup of Mrs. Olson has been sharing her amazing garden that is full of blooms. Pop over and see the beauty that Jann so lovingly tends to her garden. Carol – Art and Sand shares what she calls her funky garden. I think that it is a masterpiece that is very carefully curated. Now for the featured picks. It is always hard to pick the features because there are so many lovely posts to choose from. Thank you all for sharing. I love Amy Kims Blog post on “A Sanctuary”. I think that most of us think of our homes as a sanctuary and make them so warm and inviting. Sarah – Hyacinths for the Soul shares a truly lovely picnic. Picnicking is such a wonderful way to celebrate summer. Jemma – At Home with Jemma shares 7 simple tips to add patriotism to your decor. Just Shoot Me show how she made a wonderful herb garden. I would love to have this one in in my backyard. Many of us don’t have the option of having a lovely yard to garden, but Mary Jo – Master Pieces of my Life shows how she has made a beautiful container garden. Oh yum! 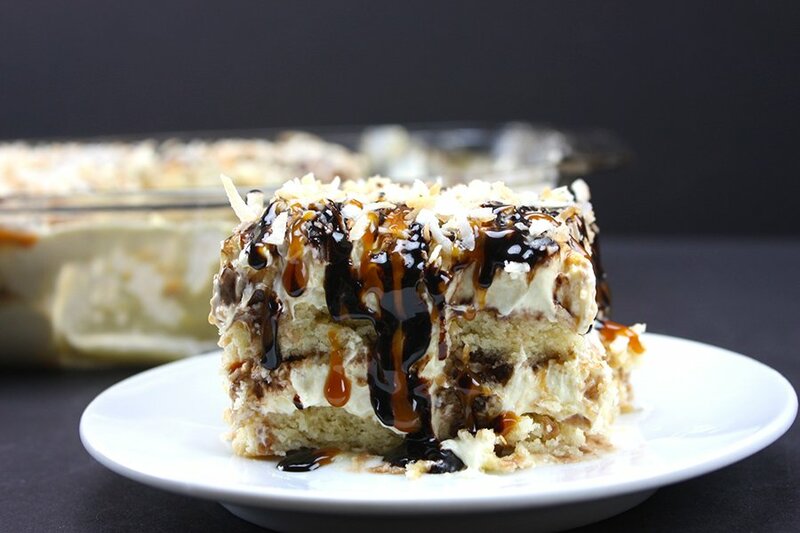 Don’t Sweat the Recipe has made a wonderful No Bake Samoa Cake. What a wonderful way to have a lovely dessert and not having to heat up the kitchen. Make sure you grab our button if you were featured this week! Thank you for sharing! Now it’s your turn to share. Click on the link below to share. This entry was posted in Anne's Attic - design, Arts and Sand, Baking, DIY, French Nordic Country Design, Gardening, Have a Cup with Mrs. Olson, Interior Design, July 4th decor, Picnic Basket, Prairie Design, Red White and Blue, Romantic Farmhouse, Shabby Chic Design, Share Your Cup Linky Party, Uncategorized, US Flag and tagged Anne's Attic - Design .com, Antiques, Art and Sand Blog, Crafts, DIY, Farmhouse Design, French Nordic Design, Handmade Accent, Have a Cup of Mrs. Olsen, Prairie Design, Romantic Farmhouse, Shabby Chic, Share Your Cup Thursday Linky Party, Vignettes, Vintage Finds by Anne's Attic - design. Bookmark the permalink. Glad to hear you’re doing better. Thanks so much for featuring my post, it is greatly appreciated. Have a wonderful day.